ZZ454/440 - An aluminum-headed 440 horse monster in a box! If you’re going to put a big-block in your project car, why not add some aluminum heads into the mix? GM Performance Parts took the venerable 454 HO, swapped the cast iron production heads for a set of our oval-port aluminum castings, and created the ZZ454. Not only do the aluminum cylinder heads flow more air, but you also drop almost 100 pounds off the nose of your car—dramatically improving performance. The aluminum heads of the ZZ454/440 help make 15 horse improvement over the iron-headed 454 HO. These oval-port aluminum heads use huge 2.25" intake and 1.88" exhaust valves as well as small combustion chambers to add to the efficiency of the 454" big-block. The bottom end includes a Gen VI four-bolt block, a forged steel crank, forged connecting rods, and forged pistons. A roller camshaft with a .510/.540" lift specs delivers a big-block loping idle as well as add to the high performance punch of the entire crate engine. 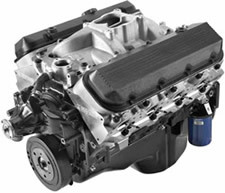 The ZZ454/440 is delivered as a complete assembly including water pump, balancer, water intake manifold, and 14" automatic transmission flexplate. All you need to do is add your carburetor, ignition, and starter to complete the project. 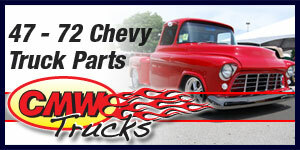 Of course, all of these parts are available through your GM Performance Parts dealer. NOTE: Distributor with melonized steel gear MUST be used with engines with steel camshafts, or engine damage will occur. GMPP HEI distributor P/N 93440806 is recommended. Requires addition of carburetor, starter, distributor and ignition system (not included). Comes with a 14" automatic transmission flexplate; use flywheel P/N 14096987 and 11" clutch assembly for manual transmission.